Being an engine builder I know the importance of getting every last tenth of a horsepower out of the engine. I also know the expense of the testing time that goes with it. Given the chance, I am going to utilize every opportunity I can to get the power to the ground. We decided to upgrade the kart to ceramic bearings in the front and the rear to free up any horsepower that we might be losing to friction. During our testing session my personal times were down to the point that one would ask what advantage would I have by going to a freer bearing if I am still not going to be at a winning place? This is a very good point and something that needs to be considered when purchasing an upgrade like this. My response is that I have confidence that these upgrades will put us in the ball game, and this will give us a kart that is giving up nothing to the competitor and that will leave us with the only variable: the driver, which we can work with. 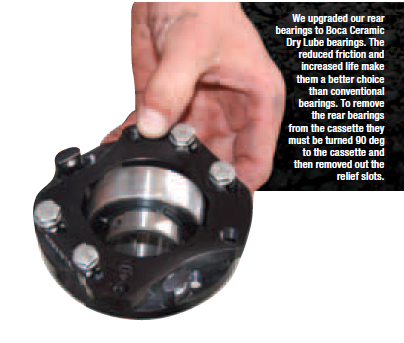 Boca Bearings who are known for making bearings for just about any application you can think of was our choice. Their ceramic dry lubed bearings were used in the rear of the kart. “Dry lube coats all the metal parts, giving them a friction free surface, combined with frictionless ceramic balls that combine for a friction free bearing. Dry lube combined with the small amount of grease (recommended to reduce noise level of bearing), gives one of the slickest surfaces available. UDL has twice the lubricity of graphite, one of the best lubrications known,” Howard Nierenberg from Boca Bearings stated. This process also keeps dirt from sticking to the bearings and causing friction and wear, Boca recommends that the bearing be ran with seals for added life. The front bearings were changed out to Boca’s Yellow Seal bearings which also incorporated ceramic balls to reduce friction and mass. On the front wheels you could really tell a difference by how much easier the wheels roll. 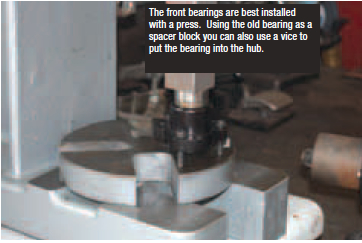 Installing the bearing is no different than installing a standard bearing. The rear bearing cassettes are removed from the axle and the entire bearing is spun until it is 90 deg to the cassette. It can then be removed out of the relieves that are in the cassette. To install, simply reverse the procedure. The difficult part is getting the axle out and apart. The front bearings are normally removed by putting the hub lightly into the vise, use a rag in the jaws to keep it from scratching the hub, and then use a punch to gradually push the bearing out with a hammer. Flip the hub over and do the same to the other side. With the bearing removed the new Boca bearings can be installed. The old bearing works really well for driving the new bearing in. 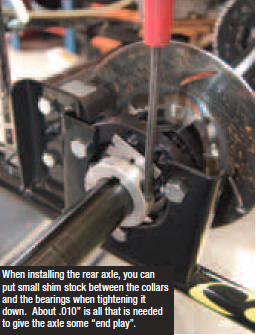 it is very important that the bearings be kept straight when installing them. 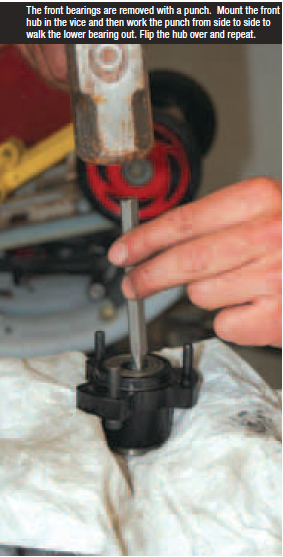 To ease the installation, the hub can be lightly heated with a torch before installing the bearing. The best method is to use a press to drive the bearing in, but a vice can be used sufficiently to squeeze the bearing into the hub. Definitely don’t use a hammer to pound directly on the bearing: damage can occur to the bearing that won’t show up for some time down the road. We wish there was a good way to quantify the performance advantage of adding ceramic bearings but there are so many variables that this becomes practically impossible. A simple method was used to prove that the ceramics do offer a reduced rolling friction. 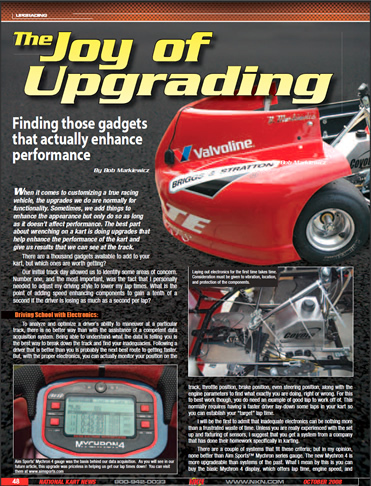 The front wheels were simply spun on the kart stand and the coast down time was measured over an average of 5 times. Not very scientific, but it at least gives us a visual representation of what effect they might have. The ceramic bearings showed a 150% better coast down time. (180sec compared to 55sec) This makes us feel good that our money is being spent wisely! To help offset the added cost of ceramic bearings they are said to have 4 times longer life expectancy than the standard bearings. Understand though, that is only the case if they are properly maintained. For example, a bearing that is put away with moisture in it isn’t going to last long no matter how good it is! If you plan to keep your kart and install the bearing early in its life, they are said to pay for themselves over time.